We eat kabab with ketchup or some other favorite dip. But in this recipe chef is serve kabab in a different way. 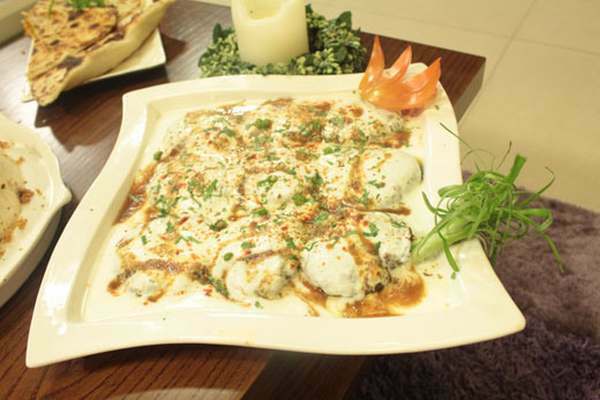 She served by pouring spiced yogurt on top and the kabab tastes great. Must try this kebab meat recipe for a tasty change. Boil the mince with gram lentil, salt, chili powder, onion, ginger garlic paste, 2 cups water until mince tender and mixture dries. Cool and chop in chopper with garam masala, hung curd, nutmeg, mace, green cardamom. Remove from chopper add in egg, chopped onion, coriander, mint and green chilies, shape into tikyas, shallow fry in hot oil on tawa till golden. To serve.Place kababs in a platter, cover generously with yogurt mixture, drizzle with imli chatni, garnish with fresh coriander and green chilies.